The best way to secure a losing season is to take the summer off. Your opponents won't rest, so why the hell would you? A high school football field stretches 1920 inches across and 3600 inches long. That equals 6,912,000 square inches of turf, and every square inch is worth fighting for. Athletes need strength to block and drive opponents and the speed to get the edge and move the chains. And it all has to happen instinctively. They must engage muscle memory so they never have to think and can just play the sport. 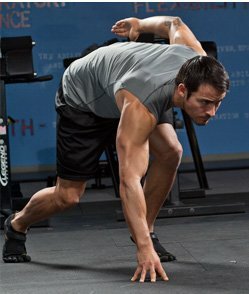 There you go, football in 3 steps: strength, speed and smarts. You don't need a Belichick brain to figure out what is ultimately a pretty simple game. How do you get there? It's a process that begins in pee-wee or flag football when you first learn to train your brain on snap counts and ball movement. The steps intensify their complexity as players tackle puberty and grow into young men, bigger, faster and smarter each season. summer, his playing time and winning potential plummet down that terrifying curve. camp may never catch up to his teammates. Even if he does manage, it may be too late in the season to save his reputation or score a scholarship offer. Do not wait until your senior year to step up. Colleges are looking at juniors with potential, not seniors who suddenly figure it out. Take a stance with these three points and get ahead of your opponents in the summer, so you can smash your opponents in the fall! If your opponent is stronger than you, he will beat you again and again. Sure, you might get lucky and slip past him once or twice, but you best remind your girlfriend to scrub harder to get the grass stains off the back of your jersey. You lift weights throughout the school year, so why stop in summer? Does the pool really take that much time? Does your summer job steal the whole day? Quit quitting. Make time for your muscle. Think of the summer lifting season as preparation for adult athleticism. If you take the summer off, you might take the next 20 years off. Then, instead of being profiled on Bodybuilding.com for your next pro contract, you may make it as a transformation of the month, from fat to flex. Teach yourself the athletic ethics that will resonate in your adult life, whether you go to college for football or economics. Trust me, the weight room is open all summer. If you can't abide on your own, then enroll in summer school and force it on yourself. Or, lift at a private gym, lift at home, or get a job bucking hay bales. Pick a fight with a bully and make him chase you all summer. Whatever it takes, lift weights. 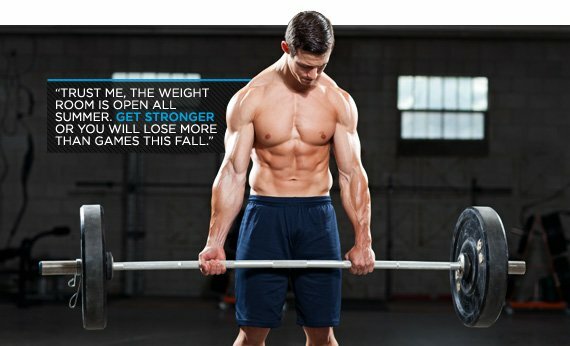 Get stronger or you will lose more than games this fall. Gather your teammates and perform "Player-Run Practices." Collegiate athletes do this every summer. When the coaches can't be around because of NCAA rules, the players get together and practice on their own. This self-initialization makes you independent athletes. If you can run wind sprints without a coach in your ear, imagine what you will do in the fall with amplified motivation! If you are a captain, this is your duty to your team. If you are not a captain, then organizing PRPs can help make you one. Earn your teammates' respect, make them sweat. Break out your playbooks and run your bread-and-butter. Draw up some new stuff and show it to your coaches in August. Run, run, run and then run some more. Make sure, of course, that you all stay hydrated. Teach the new kids how to practice like your coaches expect. Respect is important here as well. This is a team-building opportunity. Use it, but respect your teammates. Make a practice schedule and share it. You are not Bear Bryant. Earn their respect by giving them yours. Sure, enrolling in summer school will help you be around the program, but I'm talking about something else. Summer football education includes film study and memorization of the playbook, as well as muscle memory; practice makes perfect! This is a great opportunity for seniors to help underclassmen. If you show them the ropes in the summer, come fall they'll know more and the coaches can focus on more complex issues instead of recapping basic skills. Help them with their stances, their footwork, the play calls, the adjustments in coverage, audibles, route recognition, how to read zones and blocking schemes. This is a team game! Act like it. The more players who turn out to PRPs, the more of a team you will be in the fall. When 2-a-days begin in August, you will be able to pick out the guys who spent the summer smoking cigarettes down by the river. The men who lifted weights, ran wind sprints and practiced their footwork through the summer heat will rise above the rest and cream the playing field. These players become captains, make all-star teams and get scholarship offers. Even the best athlete on the team can be beat by a harder-working player. Just because you have it, doesn't mean you will keep it; just ask your uncle, who based his life on playing split end, then got fat and unhappy. Do you want that? Or would you prefer to spend your summers training for football and life. Football is life. And life, my friends, is football.